All Posts Tagged With: "Alicia Keys"
Celebrity makeup artist Nick Barose used Votre Vu products to create the look for Alicia Keys’ surprise appearance at the 2013 Sundance premiere for ‘The Inevitable Defeat of Mister and Pete’. “For the look of Alicia’s surprise appearance at the premiere of ‘The Inevitable Defeat of Mister and Pete,’ we wanted to go for a very simple, fresh and modern look. Here’s how-to. Alicia Keys 2013 Sundance look by Votre Vu. Do you love? I first applied the Votre Vu Love Me Deux in St. Tropez. Then I lightly dusted the peachy pink blush from the Beaute en Bronze blush/bronzer duo. This gave her a very natural, glowing flush because the blush has gorgeous light shimmer in it. The autumn wedding season is arriving and the perfect wedding cannot fall short of the perfect hairstyle. Along with the ultimate wedding dress, shoes, and veil, achieving the perfect hairstyle is essential for every bride-to-be. From long and straight tresses to an elegant updo with loose curls, finding the perfect style to complement your bridal look can be quite the task. Inspired by some of our favorite Hollywood starlets who have tied the knot this year, Latrice Strader, Master Hairstylist and Owner of Destiny De’Ve Hair Salon in Washington, D.C. explores the bridal styles of five celebrity newlyweds who mastered their wedding day hairstyles. Alicia Keys looked absolutely beautiful at the 2010 BET Awards. Maybe it’s a pregnancy glow or maybe it’s the Dolce&Gabbana purple satin cocktail dress. When performing Keys was wearing a black fringe corsette also by Dolce&Gabbana. I LOVE!!! 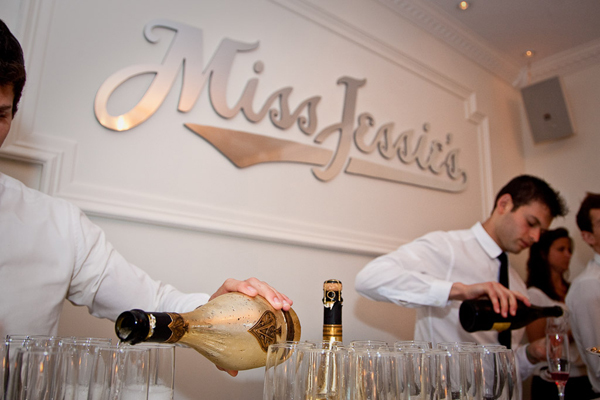 Armand de Brignac Champagne celebrated the grand opening of the famous Miss Jessie’s Hair Care Salon in SoHo. The salon will open to the public on July 1, 2010 and will boast a first-ever brick and mortar retail section in the front of the salon which will be stocked with a full range of Miss Jessie’s Hair Care including Alicia Keys’ favorite, Curly Pudding and their latest creation, Super Sweetback. Miko and Titi Branch, co-founders of celebrity and cult favorite Miss Jessie’s Hair Care, proudly announce the opening of Miss Jessie’s Salon in the heart of SoHo, a luxurious salon catering to Manhattan’s (the center of the world) curly-haired women. The occasion was marked by an exclusive preview party on June 9, 2010 with Miss Jessie’s friends, family, clientele and media in attendance. Miss Jessie’s SoHo Salon was filled with elegant décor including white flowers, candles and breathtaking chandeliers. 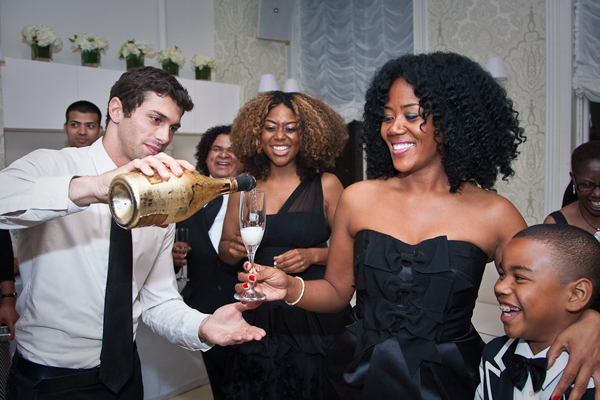 In addition, Titi and Miko treated guests to a luxurious toast of the most prestigious Champagne in the world – Armand de Brignac (Ace of Spades) Champagne. New York Fashion Week Fall/Winter 2010 Report: Avon for Mackage. Avon’s Global Stylist Advisor Tippi Shorter created the hair look for the Mackage fall 2010 runway show, supported by a full team of Avon stylists. Tippi also creates dashing ‘dos for stars like Alicia Keys and Mary J. Blige. Hair Tutorial: Here’s how to achieve this runway “Second Day Chic” hairstyle as called by Avon at-home! Apply Advanced Techniques Volumizing Mousse by Avon to hair that has been dried straight, evenly distributing create a sturdy base for the style. Use a comb to create a deep diagonal part that extends from the hairline just above outside corner of one eye to crown. Here is how to get Alicia Keys makeup look at the 2009 AMA’s with Mary Kay cosmetics. Knockout red carpet moments come with hours in the hair and makeup chair. Grammy Award-winning Alicia Keys rocked the American Music Awards showcasing a galactic style dress to go along with her majestic makeup. Longtime makeup artist, Ashunta Sheriff, was able to put together her glamorous look in a mere 40 minutes, proving that beautiful skin and makeup can come easily with the right products. Utilizing many Mark Kay products, Ashunta was able to give Alicia a stand out look to match her exciting dress. Alicia recently got her hair colored a few shades lighter with Clairol, so Tippi started off by washing her hair with the Pantene Pro-V Color Revival Shampoo & Conditioner to keep her color looking healthy and vibrant for the camera. Dior will take over the cosmetic floor at Macy’s Queens for an exclusive backstage beauty event featuring Celebrity Makeup Artist Ashunta Sheriff and the talented DiorShow Artist Team. Sheriff is one of the most sought-after makeup artists today, known for her signature “glowing skin” technique and her ability to make A-List women of color look gorgeous and radiant, whether on the red carpet or on stage in front of millions of fans. 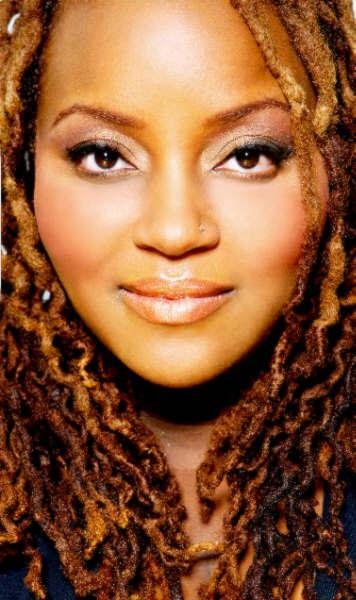 Some of her clients include: Alicia Keys, Mary J. Blige, Ciara and Jazmine Sullivan. Makeup Artist Ashunta Sheriff used Dior products on Alicia Keys for the Mandela Day Gala dinner. On Wednesday July 15, Bill Clinton hosted an exclusive Mandela Day dinner and auction for Nelson Mandela’s 91st Birthday! Makeup Artist Ashunta Sheriff used Dior makeup on client Alicia Keys who was attending the event. She used DiorBlush in Passion Fruit, Dior Addict ultra Gloss reflect in linen Beige, DiorShow Mascara in black and DiorBronze Spay powder. “We were finishing up a music video for a new song she is featured on by Alexjandro Sanz so I quickly toned down the makeup a bit with a damp sponge and intensified the eyes with DiorShow Mascara“, said Sheriff.